ISLAMABAD (September 29, 2016): In our society the child does not learn but he memorizes and we have to change this scenario through outcome based learning and teaching science, said Dr. Naim Syed in his lecture at Pakistan Science Foundation (PSF) on Thursday. A Lecture on "Why Outcome Based Teaching and Learning in the Science Curriculum is Critical" by Dr. Naim Syed, Assistant Vice President, University of Connecticut Health Centre, USA, was arranged by PSF, under its Popular Science Lecture Series. Federal Secretary, Ministry of Science and Technology, Mr. Fazal Abbas Maken, was the Chief Guest on this occasion. Pakistan Science Foundation Chairman Prof. Dr. Muhammad Ashraf (S.I.) was also present. Scientists, teachers and students from educational institutions of twin cities of Rawalpindi and Islamabad attended the lecture. Dr. Naim Syed said that if there is no learning then it is not education, but something else. He said that the concept of homework is to assess that whether the student has learnt what has been taught and this concept is also not followed in its true sense. He stressed the need for achieving the objective of learning and teaching science through different ways including outcome based and project based according to the school-class of the students. He said that the outcome of the child education should be to make him able to invent some new technology, new system or application etc. he maintained in present era the use of information technology (IT) can multiply the impact and outcome of learning and teaching. He said that IT should be used as a tool of teaching. The Chief Guest, Mr. Fazal Abbas Maken, Secretary Ministry of Science and Technology (MoST) in his remarks said that the interest and enthusiasm of participants clearly showed that the outcome of the lecture has been achieved. He said that outcome of education is what we want to achieve from it. Mr. Maken said that education is a two-way communication between teacher and students and it is in fact the urge to know. He stressed the need for a viable system of evaluation to measure the outcome of teaching and learning. 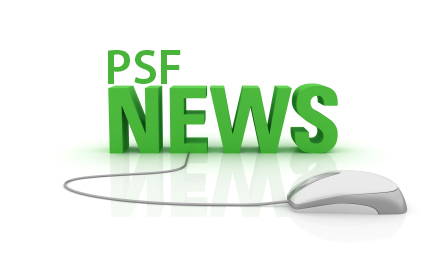 PSF Chairman Prof. Dr. Muhammad Ashraf in his remarks highlighted the problems in science education and Pakistan Science Foundation’s different programs to improve the education system. He said that for making Pakistan self-reliant in science and technology we have to strengthen the science base of students. He said that tender-foot students could not compete in the race of world development and to achieve this objective we have to change the education from memorizing to understanding. 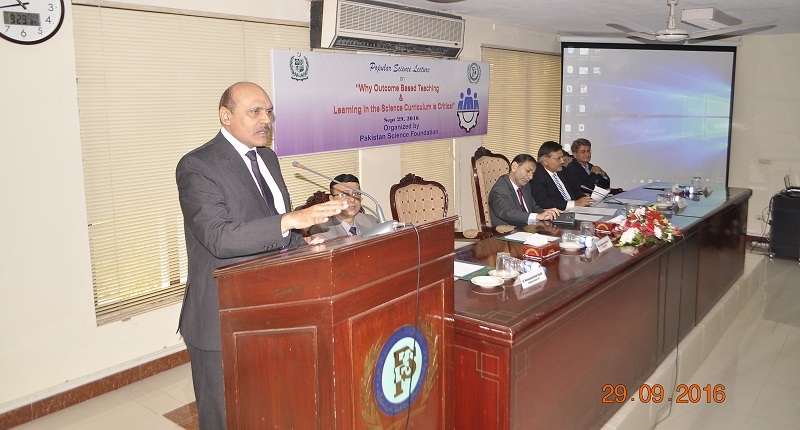 Later, Secretary MoST Mr. Fazal Abbas Maken chaired a technical session of educationists and scientists from relevant institutions in order to thrash out modalities for brining improvement in learning and teaching science through improved curriculum. In this meeting opportunities were explored to launch projects for appropriately using IT as a tool in learning and teaching so as to multiply the impact of education outcome. The Chief Guest, Mr. Fazal Abbas Maken, Secretary Ministry of Science and Technology (MoST) in his remarks after a Lecture on "Why Outcome Based Teaching and Learning in the Science Curriculum is Critical" by Dr. Naim Syed, Assistant Vice President, University of Connecticut Health Centre, USA. 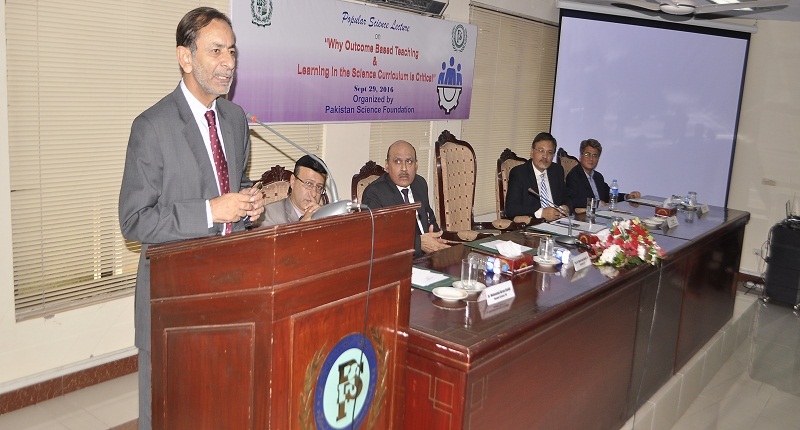 Dr. Naim Syed, Assistant Vice President, University of Connecticut Health Centre, USA, delivers a lecture on "Why Outcome Based Teaching and Learning in the Science Curriculum is Critical" at PSF on September 29, 2016. 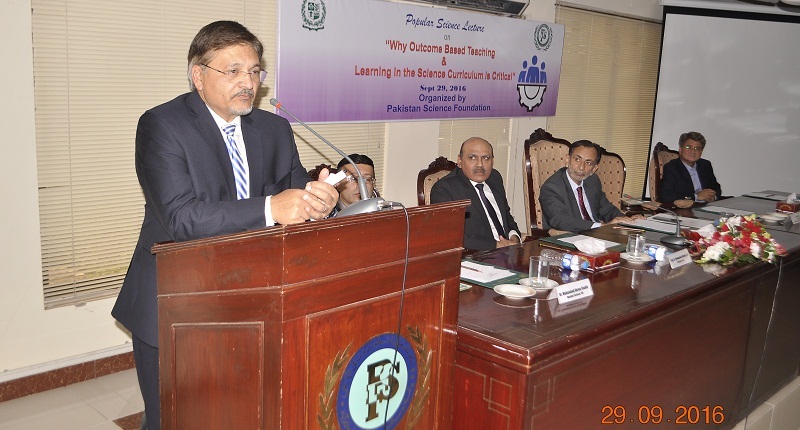 Prof. Dr. Muhammad Ashraf, Chairman PSF delivers his introductory remarks at the lecture on “Why Outcome Based Teaching and Learning in the Science Curriculum is Critical” at PSF on September 29, 2016.